Goucher was ranked No. 6 on a new list of the nation’s most innovative schools — those colleges and universities that are making the most innovative improvements in terms of curriculum, faculty, students, campus life, technology, or facilities. The rankings were based on the survey responses of top college officials; the schools that received the most nominations for making promising changes on campus were ranked in the guide. A recent example of the college’s innovative spirit is the Goucher Video Application, which allows students to forgo transcripts, test scores, and other traditional application materials. Instead, applicants can send Goucher a straightforward, two-minute video about how they see themselves flourishing at the college. The college has remained at No. 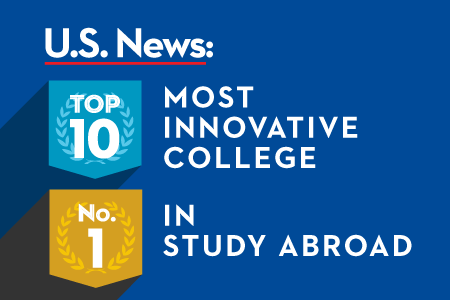 1 on the list for the colleges and universities with the most students studying abroad. The schools on this list had the highest percentage of 2014 graduating seniors who participated in study abroad programs during their undergraduate years. Goucher also was tied for No. 76 on the list of “High School Counselor Rankings,” in which a nationwide sampling of public high schools cited which national universities and liberal arts colleges they think offer students the best undergraduate education. Goucher is included as a national liberal arts college that is one of the “A-plus Schools for B Students,” which are institutions that have strong ratings in the 2016 U.S. News best colleges rankings, but that also accept a significant number of students with transcripts that are above average but perhaps not perfect. The college is listed among the national liberal arts colleges with the highest levels of economic diversity, as measured by the percentage of undergraduates receiving federal Pell Grants for low-income students. Economic diversity has received growing attention in higher education, particularly at more elite schools that haven’t traditionally enrolled large numbers of low-income students or students from low-income families. Goucher’s economic diversity is buoyed by college’s efforts to make higher education more affordable and more equitable. Goucher was included in U.S. News’ list of schools that offer the largest need-based financial aid packages, on average, during the 2014-2015 school year. The typical aid package has three components: need-based scholarships and grants, need-based loans, and work-study. The college is also listed among the national liberal arts colleges with the highest levels of campus ethnic diversity. To compile the list, U.S. News factored in the total proportion of minority students, leaving out international students, and the overall mix of groups. The data are drawn from each institution’s student body for the 2014-2015 school year. Also underscoring Goucher’s commitment to diversity, the college was included on the list of national liberal arts colleges with the highest percentages of international students in the 2014-2015 academic year. International students add great diversity to Goucher’s community and enrich the experience of other students on our campus. With an average class size of 17 and a commitment to personalized student instruction, Goucher was included in the list of schools with the highest proportion of classes with fewer than 20 students. Goucher was ranked No. 79 on the list of best schools for veterans. The list was compiled based on the institutions’ participation in federal initiatives that help veterans and active-duty service members pay for their degrees. The college’s Welch Center for Graduate and Professional Studies also was highlighted in the U.S. News rankings. The college and center were included on a list of the best online master’s in business degree programs, based on factors such as level of accreditation, reputation for excellence among peer institutions, and academic and career support services offered to students. Overall, Goucher was tied at No. 112 in the list of national liberal arts colleges. This year’s edition of the U.S. News’ Best Colleges ranking includes data on nearly 1,800 colleges and universities nationwide. Eligible schools are ranked on up to 16 measures of academic excellence, including graduation rates, selectivity, and freshmen retention. Click here to view Goucher’s complete profile. Goucher College unveiled a new website on July 31, 2017. The new website features a newly designed news section. To view all Goucher College news since July 1, 2017, visit http://www.goucher.edu/news. To see archived news prior to that, please explore this “In The Loop” website.